The Pirates have developed a reputation for their work with pitchers. Ray Searage seems to receive most of the credit, but the club’s recent successes with arms like Francisco Liriano, Edinson Volquez, A.J. Burnett, J.A. Happ, and Joe Blanton is probably a group effort to some degree. No matter who the true pitcher whisperer is, the Pirates have clearly become a team that takes pitchers who weren’t great and turns them into pitchers who are good. It’s not clear if the club is particularly adept at targeting pitchers who are poised to recover or if they have a formula for fixing arms with strong potential. In either case, all their recent success suggests the Pirates have something working for them that most teams don’t. And when a reputation like that takes hold, it’s easy for us to fall into the trap of assuming they’re going to go on like this forever. Call it a Ray Searage halo. 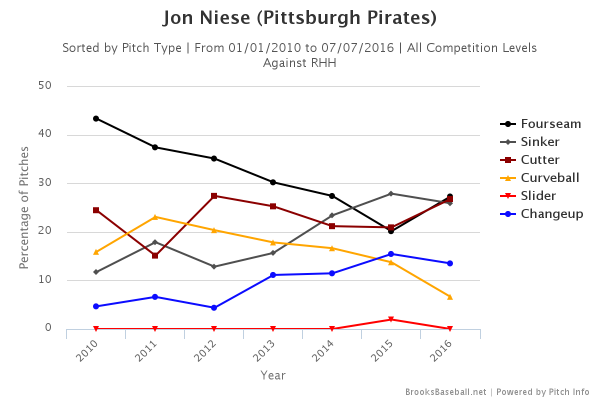 Unfortunately for the Pirates, the halo has not protected Jon Niese. This winter, the Pirates dealt second baseman Neil Walker to the Mets for Niese in a trade designed to capitalize on Niese’s 2017 and 2018 options in exchange for Walker’s higher 2016 value. It was a bit of a gamble for both sides, but it’s easy to see that both clubs were looking to trade from depth to to fill a hole. Walker is having a season that can best be described as extremely Neil Walker-ish, but Niese’s move west hasn’t gone quite as well. With one start left before the break, Niese has the worst park-adjusted ERA of his career and by far the worst park-adjusted FIP. He’s never been a star, settling in as a 2-3 WAR player during his better years, but the significant struggles this year warrant a fuller investigation. If you look at his standard stat line, you’ll notice a slightly lower strikeout rate, a pretty normal walk rate, a BABIP resting at his career average, and a very respectable left-on-base percentage (LOB%). You can boil Niese’s 2016 problems down to a single number: his 1.74 HR/9. Niese’s previous career high HR/9 was 1.04, his ability to suppress homer due in large part to his tendency to generate ground balls. This year, Niese’s ground-ball rate remains intact at a career-high 54.7% mark, but his home-run rate has ballooned. 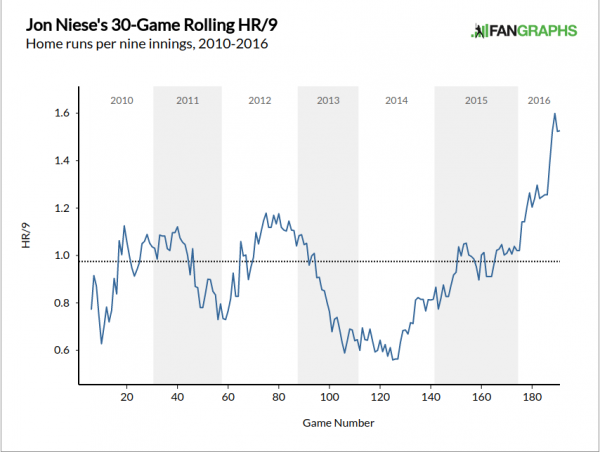 In fact, Niese is just four home runs away from setting a new career high despite not yet crossing the 100-inning mark for the season. 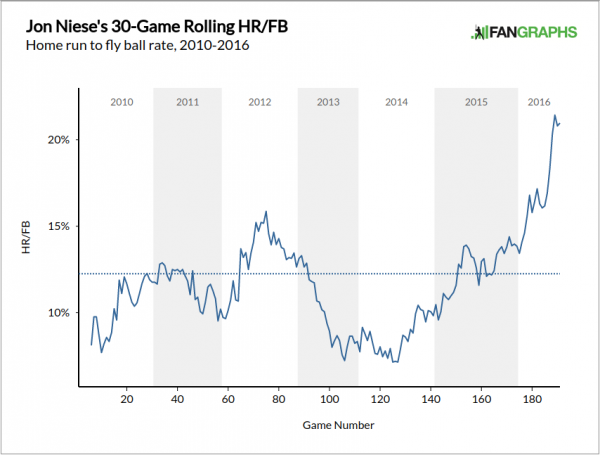 Whenever we’re dealing with something like home-run rate, which is more susceptible to variance than most basic stats, it’s helpful to look at a rolling average. Certainly, this 17-start stretch has been rough, but how do his last 30 starts compare to his career norms? No major-league pitcher’s true talent lies in the 20% HR/FB neighborhood, but the fact that Niese has been so homer prone lately is interesting. Put that together with the fact that his home-run numbers appear to be driven by a big spike against righties, we should dive deeper into how he’s approaching them this year. Considering that PNC Park is the second-hardest park for right-handed home-run power, a simple context adjustment won’t do. One thing that jumps out at first is that Niese has thrown fewer curveballs since coming to Pittsburgh, in favor of more fastballs — particularly the four-seamer and cutter. The general reaction to the zone profile presented here is that pitches low in the zone are less likely to be hit out of the park, but I think there’s a little more going on here. Since coming to Pittsburgh, Niese’s pitch selection and location have become more predictable to righties. Niese’s doesn’t generate many swinging strikes, which is a good proxy for telling us his stuff itself isn’t that impressive, although you probably know that if you’ve spent much time watching him over the years. If you’re a pitcher without impressive velocity or a great complement of secondary pitches, the way you command your pitches and mix up their sequencing plays a larger role in your success. Niese is following the Pirates’ model of working inside with a lot of fastballs, but he might not be the kind of pitcher who can get away with being this predictable. It’s hard to do damage on well-located pitches inside, but Niese doesn’t have the kind of margin for error from which some of the previous Pirates success stories benefited. I certainly don’t think Niese’s struggles disprove the Pirates Way, but it’s a good reminder that even well-designed systems aren’t one-size-fits-all. There could certainly be a lot of factors at play, but it seems worth having Niese work back to a less predictable approach in terms of pitch mix and location. In fact, Niese’s struggles might prove to be an excellent test of the Pirates’ ability to get the most out of their pitchers. Clearly the first half has gone poorly for Niese, but now that the club has seen him up close and received feedback from hitters about what works and what doesn’t, changing direction midstream and squeezing a good second half out of Niese will show how well the Pirates can truly handle pitchers. 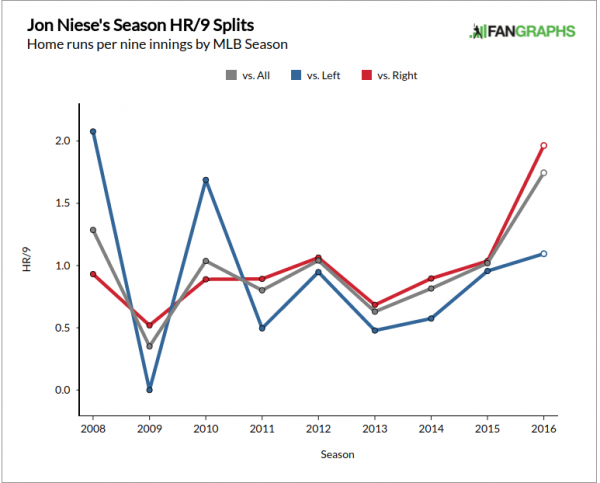 One data point won’t dramatically shift their reputation, but if they can turn Niese around in the second half after he’s failed to excel with their standard approach, it will be easier to give them credit for tinkering rather than just finding the right pitchers at the right time. We hoped you liked reading Fixing the Pitcher the Pirates (!) Made Worse by Neil Weinberg! While Niece’s homer issues are problem #1, he’s still putting up an xFIP that would be the worst of his career*. The walk rate he’s putting up this year – 3.12 BB/IP – is 0.96 higher than his 2.3 WAR 2014. He succeeded with one nearly as high in 2013, but that involved a higher K-rate than he’s generated since. Which is to say, even if his dinger rate gets fixed, the rest of his peripherals don’t paint the picture of the 2-WAR pitcher he once was.